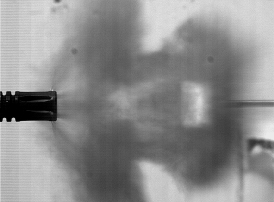 Although propellant (“gun powder”) for small arms cartridges creates its own oxygen as it burns it is still considered to be ‘under-oxidized’. Under-oxidized means that the reaction could burn more fully if there were more air introduced into the burning propellant gas cloud. 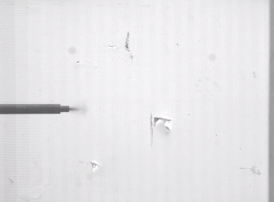 This is precisely what happens when the propellant is ejected from the barrel and the surface area is increased—introducing more oxygen into the reaction. You would like to have this take place in the chamber but practical considerations appear to make this impossible. In a sweep of cosmic irony, this increased rate of reaction takes place immediate outside of the muzzle where you would least like it to occur. This is because the large ‘fireball’ is capable of alerting enemies to your location at distances of hundreds of yards away in the case of excessive muzzle flash. The image at left demonstrates the hidden logic behind ‘assault weapon’ bans which always include flash hiders at the top of the list. The treasonists behind such legislation not only want you disarmed, they want you ignorant of the performance characteristics of the equipment that you currently own. Flash hiders are usually first on their list of ’banned features’ because they work to reduce your vulnerability while shooting at night. If you can be seen, you can be hit. If you can be hit, you can be killed. For the record, the other features on the list are usually focused on scary-looking features that are vestiges of the military heritage of so-called ’assault weapons.’ Collapsible stocks are for use in parachuting and grenade launchers are useless without the availability of high-explosive grenades. 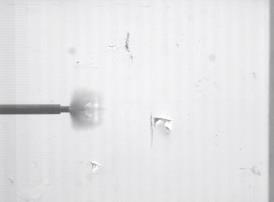 Notice in the bare muzzle shot (top) how the propellant cloud begins to ignite at the periphery of the projectile and that the gas cloud is roughly spherical in shape. Spheres have the characteristic of having a maximum internal volume and a minimal surface area. This is an unfortunate occurrence for someone who is fighting for their life at night. A hot object cools by exposing the hot surface to a colder environment. The longer a fireball persists (though only for a small fraction of a second), the warmer the center becomes and the larger the gas cloud becomes. This creates a larger, brighter flash ball. 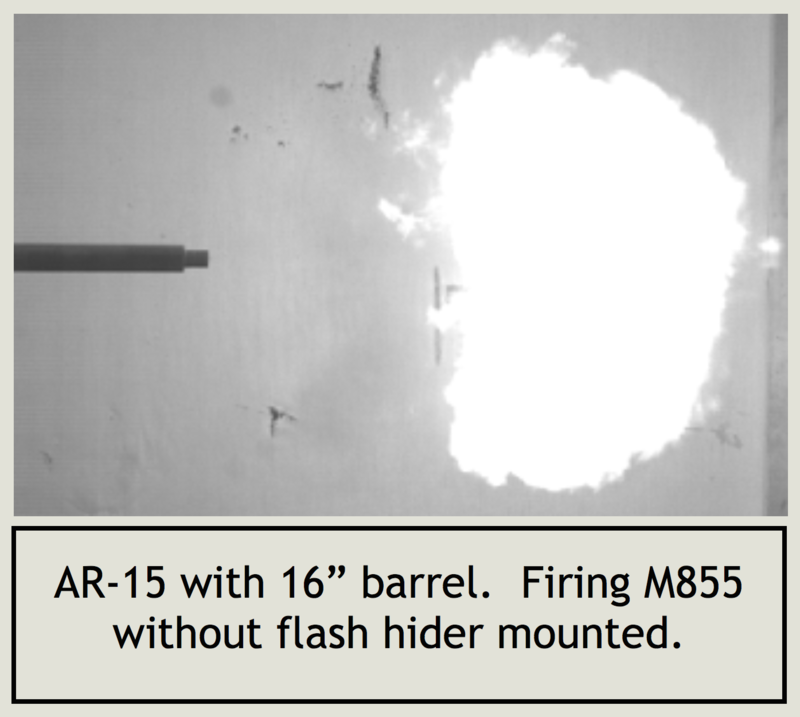 The purpose of the flash hider (bottom) is to cut this fireball into narrow fins. Motorcycle engines and other air-cooled engines use cooling fins to increase the surface area of the cooling object in the colder air that surrounds it. 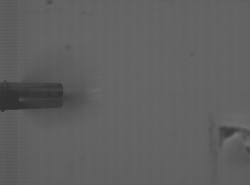 In the same way, the flash hider separates the gas into very thin, long, jets of propellant gas. Ideally, the jets of gas will be cooled quickly enough to bring the temperature of the propellant grains below the ignition temperature. Secondarily, the orientation of the fins is such that an aggressor located in the target area will only see a very thin flame front emerge from the flash hider, if any flash emerges at all. Some ammunition flashes more than others but a properly designed flash hider will reduce all flashes to a small fraction of what it would be from a bare muzzle. Most criminal attacks happen at night and many criminals run in packs. The guy you shoot may have buddies hiding in the dark. I highly recommend that you have a flash hider on every self-defense gun that you own. Occasionally, people will ask me for a recommendation on flash hiders. My first recommendation is to buy one that is labeled a flash hider. We’re too late in the game to be playing around with ‘maybe’ like muzzle attachments with advertisements that say things like ‘also reduces flash!’ and so on. Muzzle compensators ‘may’ reduce flash but if your defensive gun kicks hard (like the 308 Winchester carbines) then I would encourage you to buy the flash hider, speak with a competition shooter about modifying your hold on the gun and importantly, increase your physical fitness to help deal with the recoil. 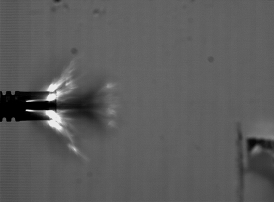 This design produces less flash than the closed design because there is no high pressure control volume where the gas ’bottleneckes’ as a large volume of gas attempts to curve out and around the ring on the end of the birdcage type flash suppressor. The drawback of this is that the open prong design must be slightly longer to increase the ‘back pressure’ to force the propellant gas into the prongs as opposed to continuing its path forward with the projectile. Handguns offer interesting options for flash suppression. Since external flash hiders are not terribly practical on concealed carry handguns, it would be wise to take a look at selecting ‘flash suppressed’ ammunition for self-defense. Happily, many of the ammunition producing companies offer their premium ammunition with this feature. 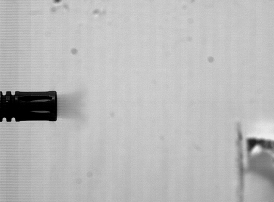 Unhappily, there is a rule-of-threes for reducing muzzle signature with propellant chemistry. If you decrease muzzle flash, then smoke and noise will increase. If you decrease smoke, then muzzle flash and noise will increase. If you decrease the noise, then smoke and muzzle flash will increase. 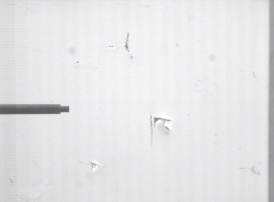 Testing of your ammunition in your gun is the only way to know what to expect. Sound suppressors are large and legally regulated in many areas. They are also a superb answer to eliminating muzzle signature from a handgun and a submachinegun. Rifles muzzle signature is also greatly reduced by the use of a suppressor but the subsonic handgun is still the key to firing with greatly reduced chance of enemy detection. At left is the AAC Ti-Rant (45 ACP) fitted to an UZI with 16” barrel length. 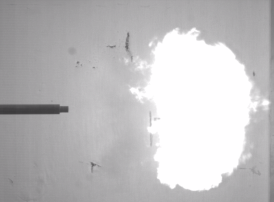 The muzzle flash is completely eliminated and the smoke discharge is negligible. Barely louder than a hand clapping together, the observer would have to be within 15 meters of the muzzle to hear the gunshot. Since we are funded by our fans and the shooting community, there is a limit to what can be tested due to a limit existing with our funding. 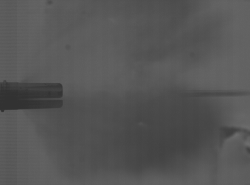 It is my intention to continue to build on and expand the collection of slow motion videos and analysis of different muzzle devcies and ammunition in action. 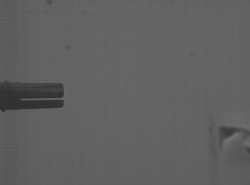 Below you will find the up-to-date collection of publically-released slow motion video and analysis for different muzzle devices and firearm types.